Pete McCreary cheerfully looks at a calendar pulled up on his computer screen and points to Monday, December 18. “You see that? That was a busy day,” he says. And what constitutes a “busy day” in Junk King’s world? Well, there were 18 appointments. That’s “huge” for a day in mid-December. Sometimes a large appointment may demand up to five trucks. 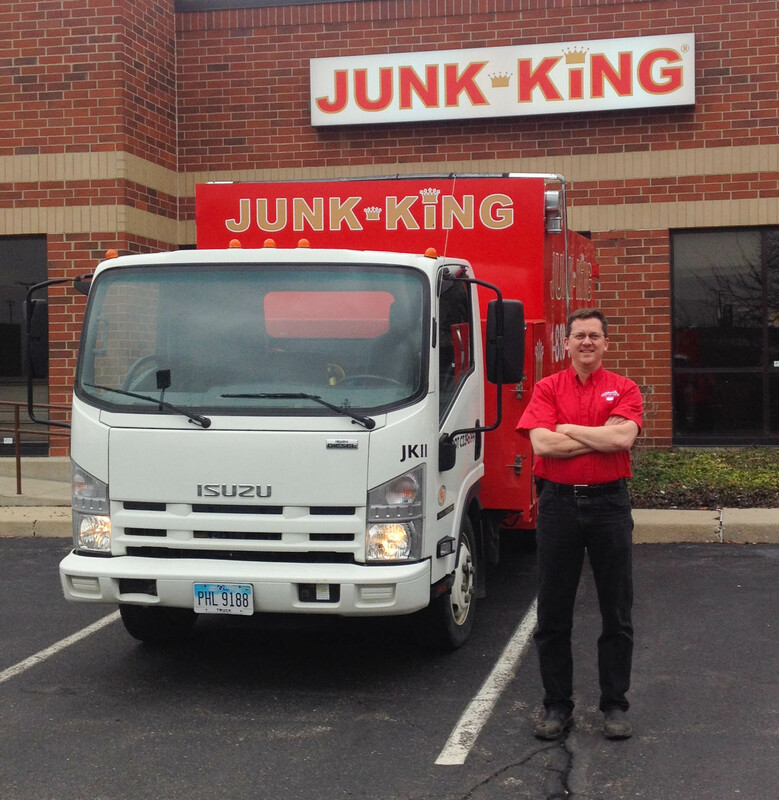 Other times entire offices need to be cleaned out … and Junk King must respond with 20 trucks to haul away materials. McCreary owns two Junk King locations. One is in Dayton and the other just north of Cincinnati in Sharonville. His team of 18 drivers hauls away junk — and a few treasures — from Union, KY to Piqua. McCreary’s operation is one of the most successful in the entire Junk King franchise. McCreary got his start five years ago when he was looking to start a business. “I knew I wanted to help older folks” he said, when asked about his initial interest. After an experience with a family member, he began to seriously think about the hauling business. A close friend had a similar experience and he soon reached out to someone working in the business. “It was perfectly good commerce,” he said. He decided to buy into the Junk King franchise. “I loved their emphasis on recycling,” he said. “I started checking into their business model and realized it would be a perfect fit for what I wanted to do. McCreary started working with BarryStaff this year and so far the staffing agency has provided him with two employees. “It’s nice to call and say, ‘Hey, we need a couple guys,'” he said. So where does he see Junk King going from here? In ten years, he’d like to have between 15 and 20 trucks (currently there are seven). Junk King’s employee tally is growing each year, so there’s no telling how large his operation could be in a decade. “There’s a lot of business we’re starting to tap into,” McCreary said. Click here to watch a short video shot inside Junk King.